This post shows how to implement a use case where you don’t want the user to leave a field which has a validation error. ADF does a good job enforcing that all validations are checked at the time you submit the data. However, if you want the user to correct an error in a field directly, you have to implement it yourself. A validation error can be a mandatory field which the user has not filled in or a where the user has filled in wrong data. In such a case you want that the user must correct the error before she/he is allowed to move to the next field. We start with a fragment whihc holds two af:inputText components. One we use to simulate a mandatory input text and the other for a normal input text field. That is the normal behavior ADF gives you out of the box. The use case we implement here requires, that the user can’t leave the field once an error is shown for the field. So if the user sets the cursor to the ID field he can’t navigate away from it until he fixes the error. He can’t even click hte button. 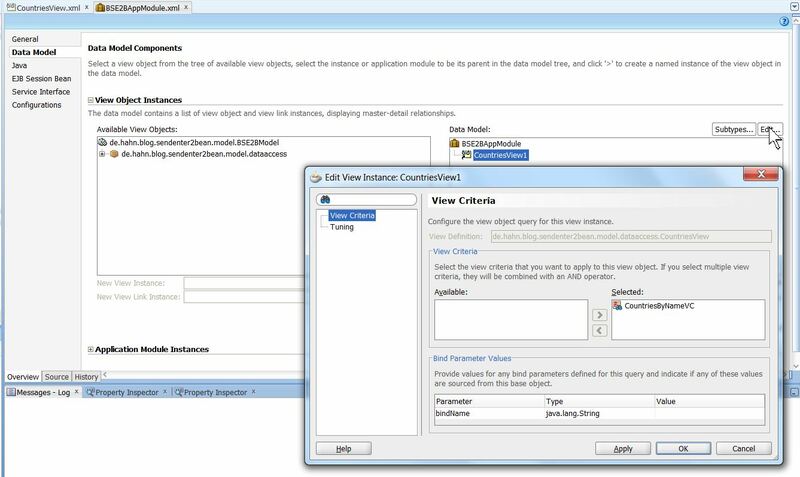 ADF would allow the user to leave the ID field to enter some value into the Name field. So how do we prevent the user leaving the field by clicking in another field or clicking on a button? We use an af:clientListener which listens for the ‘blur’ event checking if the field contains a value. If not, we set the focus back to the component and cancel the ongoing even. Setting the focus back to the component is essential as the blur event tell us that we loose the focus. This only happens if the user navigates away from the field. <af:inputText label="ID (mandatory)" id="it1" required="true"
This is it. But wait, what if we like to check if the value entered by the user is valid? Note that we add two parameters to the call to the bean method. 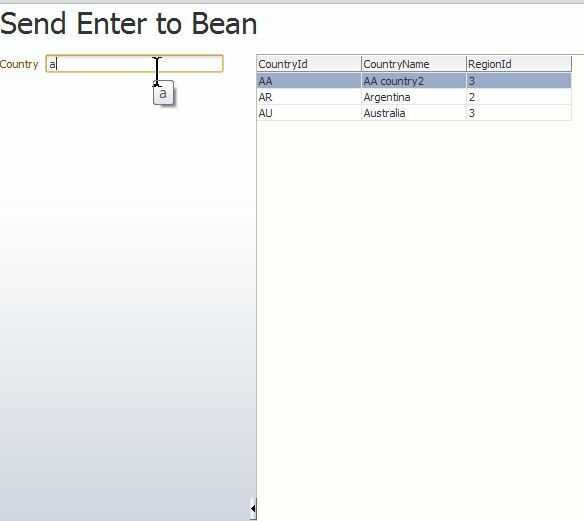 The first parameter fcid is the client id of the component which calls the bean method. The second parameter fvalue is the value the user has entered into the field. We see why we need the parameters when we talk about the bean method. In the bean we implement the custom validateServerListener method. First we get the two parameters from the ClientEvent and log them to the console. At this point we can e.g. call an application module method with the parameter we got. In this simple same we just check the value for a specific value, in this case ’88’. When the value is ’88’ we add a FacesMessage to the component with the clientId we got as second parameter. // here we check against 88 to keep it simple. You can check against other model values here too! You can download the sample application from GitHub BlogNoNavigationValidation. The sample doesn’t use a model layer, so no DB connection is needed. This blog article describes a common use case. A user enters some value into an field on the page and his enter. This should trigger a method on the server (e.g. a bean method). Hitting ENTER on a af:intputText component should trigger an action (e.g. executing a bean method). The sample we implement in this blog shows a page with a splitter component. On the left side we see an input text component which is used to enter a value. On the right side we see the result of the search as a table of countries from the HR schema. 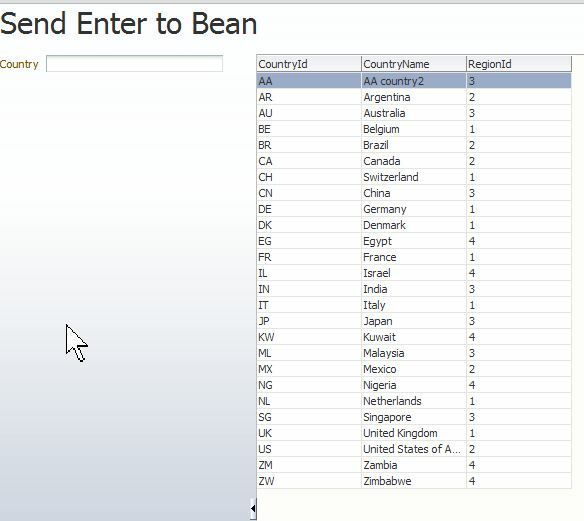 The search condition used is to show all countries which names starting with the value entered in the input text component. As you see there is no button ot other command component to execute the search. The search is triggered by hitting enter in the input text field on the left side of the splitter. The server side method now calles the “executeWithParams” method on the courntries iterator which filters the countries table for countries starting with the value given by the input field. 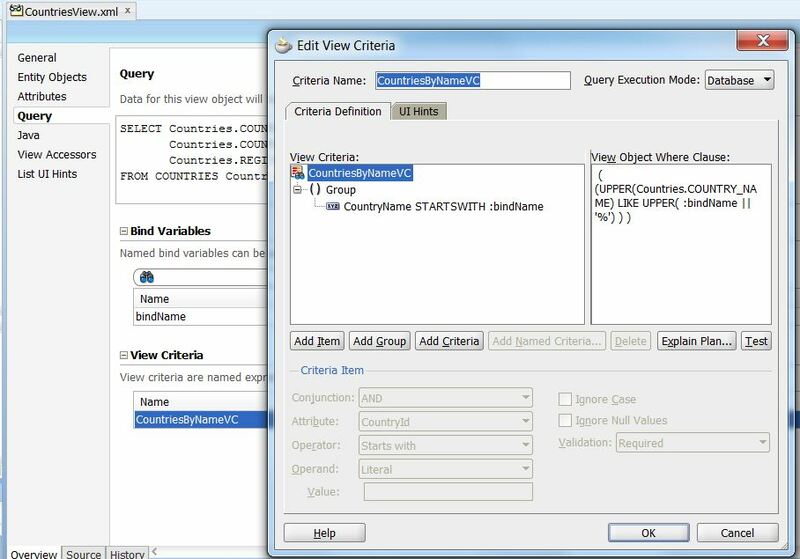 In the data model of the application module we use the view object instance CountriesView1 and select the ViewCriteria as query. Now in the ViewController project we only need to store the value entered by the user in the af:inputText field and add add a method binding for the “executeWithParams” method which we use in the bean method to filter the table. This entry is more for me to remember,as I’m sure I have read this somewhere before. If someone has posted this before please drop a comment do that I can give credit to her/him.